We raise our puppies with not only a high protein kibble, but steamed meat, mixed vegetables, fruits, yogurt and whole grains. Balance is the key to health, and in 14 years of owning PWD's, our adults have only been to the veterinarian for immunizations and genetic testing. We have extremely healthy dogs and puppies and are proud to pass this high level of health on to you, for years of joy. Vegetables in a steamer with rice and meat can make a weeks worth of food for your puppy, at much less cost than a highly processed kibble. in drought-hit U.S. cornpany thconcern. High levels of a dangerous toxin found in bagged dog food on a grocery store shelf in Iowa have highlighted the prevalence of a problematic mold in last year's U.S. corn crop, as state and federal officials work on limiting the food safety concern. "Last year's corn crop-it is a huge issue: We test every load coming in and we reject a lot of loads" said Michael Wright, chief executive office of Pro-Pet, an Ohio-based pet food manufacturer that learned last week some if its product was tainted with aflatoxin, a naturally occurring poison that can cause serious illness or even death if consumed. Aflatoxin is the by-product of a mold that flourishes in dry conditions, and last year's historic drought in the U.S. Midwest put everyone from farmers to grain handlers and food industry officials on high alert. "Anybody using corn has to be very selective" Wright said. The problem hit home for the Hy-Vee Inc grocery chain when the company announced late Friday that it was recalling five different product lines of its privately branded dog food. The products, all manufactured by a Kansas City, Kansas, Pro-Pet plant, were recalled across eight Midwestern states due to elevated levels of the aflatoxin contaminant contained in the corn used to make the pet food, the company said. Corn is a common ingredient for a range of pet foods and is a key feed grain for dairy and beef cattle, hogs, and chickens, as well as a range of products for human consumption. The corn used in the Hy-Vee dog food had been tested before it was blended into the pet food and Pro-Pet officials said they tested finished products as well. But this contamination was not discovered until a random bag was pulled for a store shelf in Iowa by an inspector for the Iowa Department of Agriculture. The sampling is part of a cooperative agreement that the Iowa Department of Agriculture forged with the U.S. Food and Drug Administration as an added measure to protect against aflatoxin consumption, said Dustin Vande Hoef, a spokesman for the agriculture department in Iowa, the top U.S. corn-growing state. Human exposure to high amounts of aflatoxin is rare, But aflatoxin contamination prompted a series of pet food and livestock food recalls in December 2011, including products produces at Cargill's Lecompte, Louisiana, plant and a Proctor & Gamber Co plant in Henderson, North Carolina. This year the toxin was much more prevalent. According to crop insurance data from the U.S. Department of Agriculture, payouts for mycotoxins, of which aflatoxin is the most common, totaled nearly $75 million, triple the level of a year ago. Nearly 85% of the claims were filed in six states: Arkansas, Illinois, Indiana, Kansas, Mississippi and Missouri. Mycotoxins are produced by fungi and can cause kidney and liver damage, suppress the immune system and disrupt absorption of nutrients, among other problems. Hy-Vee spokeswoman Ruth Comer said the company was alarmed when it learned of the contamination last week, but the results are not surprising given the conditions. "The toxin becomes more prevalent in a drought year," Comer said. "We had worse drought this past year than we've had in years, so it's not totally surprising that we have a bigger aflatoxin problem this year than in the past." No pets have been reported to have suffered illness from the recalled products, Comer said. Expectations for higher concentrations of aflatoxin were set even before the new bushels were harvested last fall. In September, Iowa, Illinois, Indiana and Nebraska received FDA approval to increase the amount of aflatoxin-afflicted corn that could be blended for animal feed. The FDA granted Iowa a similar request during droughts in 2003 and 2005 when aflatoxin was found in the state. The blended corn must be clearly identified and labeled for animal feed use only, and allowable aflatoxin levels are limited depending upon usage. The Iowa state agriculture department also is requiring the testing of all milk for aflatoxin, it said. Pat Tovey, director of technology and regulatory compliance with the Pet Food Institute, whose members produce more than 7 million tonnes of pet food annually, said preventing aflatoxin contamination is a high priority for the industry. "There is certainly more awareness this year." he said. "This is such a big issue in pet food." If you're on the lookout for new and fun ways to rev up your furry best friend's diet, adding vegetables and fruits can be a really healthy way to do that. 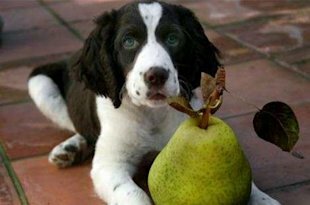 Of course certain veggies and fruits will be better for your dog than others. Take a look at the following 10 healthiest human foods for your dogs' diet, and consider adding them to your own dog's meal routine. Cantaloupe Believe it or not, the same fruit salad staple that humans have come to know and love is just as good for dogs. They're full of vitamins that will help with your canine's eyesight, as well as lots of vitamin A and lots of beta carotene, which helps reduce the risk of cancer and prevents cell damage. It's also a good source of vitamins B-6 and C, fiber, folate, niacin and potassium. Green Beans Getting your dog to eat his green beans will probably be easier than getting your kids to do the same. Green beans are good for your pooch because of their omega-3 fatty acids and vitamins A, C, and K. They're also a good source of calcium, copper, fiber, folic acid, iron, niacin, manganese, potassium, riboflavin and thiamin, as well as beta carotene. Essentially, they're the superpower of vegetables for your pooch. Spinach We certainly understand the value of spinach in our own diets, but luckily this green, leafy vegetable can be just as powerful for your dog. Although it's high in iron (with almost twice as much of it as most other sources), spinach is a particularly good option for your dog since it helps fend off inflammatory and cardiovascular issues, along with cancer. Apples Besides the fact that it's super fun to watch a dog eat an apple, the powerful antioxidants and loads of vitamin C will do wonders for your dog's diet, as well. Pumpkin Feed your dog pumpkin to load him up on fiber, vitamin A and anti-oxidants to help alleviate diarrhea and constipation and to promote his overall cardiovascular health. Sweet Potatoes A great source of vitamins E, A, B-6 and C, as well as calcium, iron, folate, potassium, copper, thiamine and iron, sweet potatoes are a wonderful (and super tasty!) addition to any pooch's dinner bowl. These sweet spuds have got fiber, vitamins and carotenoids up the wazoo. What’s the best way to prepare them for canine consumption? You wouldn’t want to eat sweet potatoes raw, and neither would your pooch. Serve them up in a dog bowl cooked, mashed or even dehydrated. Just don’t add salt or butter. Blueberries Blueberries, with their high levels of resveratrol and their anti-cancer and heart disease fighting qualities, make a great option for your dog's diet. As an added bonus, the tannins found in blueberries also help prevent urinary tract infections. Watermelon If it's lycopene that you're looking to add to your dog's diet, watermelon is your best source for that. The health benefits don't stop there, though. Give your pooch a piece of this delicious summer treat and you'll be loading him with up with tons of healthy vitamin A, B-6 and C, as well as thiamin. Asparagus When cut into bite size pieces, Asparagus makes a healthy veggie option for your dog because of its vitamin K, A, B1, B2, C and E, along with the folate, iron, copper, fiber, manganese and potassium that's found in them. Yogurt is one of the best treats you can give dogs for the same reasons it’s so often recommended to humans: it’s packed to the rafters with probiotics, vitamins, protein, calcium, riboflavin, zinc and potassium. But be as judicious with selecting yogurt for your dog as you should be with yourself. Avoid yogurts that are chock-full of sugar, preservatives and other additives. By the same token, fat-free yogurt is an acceptable option for dieting dogs, but be careful not to choose a brand that replaces the fat with an artificial fat substitute. All-natural is the name of the game here. Cheese is one of those foods that most of us can agree on. Almost everyone loves at least some cheeses, and you probably have a few lactose-intolerant friends who lament the one thing they really miss eating is cheese. Well, the same is true for dogs. They’re usually eager to gobble up some cheese, and generally it’s perfectly safe. But like us, dogs can be prone to lactose intolerance, so tread lightly. Cottage cheese is a good choice because it’s gentle on sensitive tummies. When it comes to “people food” for our pets, fish is typically thought of as a favorite meal of cats, and that’s true, but it doesn’t mean dogs can’t also enjoy the health benefits of some fresh, delicious salmon. The fish is a great source of protein, and it boasts a ton of omega-3 fatty acids which promote a strong immune system, healthy skin and a shiny coat. And if your family has both dogs and cats in the home, that’s all the more reason to stay stocked up on this nutritional powerhouse. “Eat a green thing every day” is an age-old dietary tip that stands for people and their dogs alike. Getting your kids to eat green beans can be an ongoing battle, but your dog will probably wolf them right down. You already know that green beans are nutritious because they’re full of vitamins, minerals and fiber, and since they’re so low in calories too, they make a great weight-management snack for dogs that have put on a few extra pounds. Carrots are an excellent choice of a vegetable snack for dogs. Dogs love to chow down on carrots because they’re sweet and delicious, and they’re healthy because of all the vitamins, fiber and potassium they carry. As a bonus, carrots are great for canine dental health too. Veterinarian Dr. Marty Becker suggests baby carrots as a snack to help remove plaque from your dog’s teeth and keep its breath fresh and pleasant. Warning: Spaghetti is not one of the 5 human foods to feed your dog (but it's a really cute picture). Most of the time, pet owners are cautioned to never feed their furry friends "people food." Veterinarians often remind pet owners that chocolate, grapes, and raisins can be poison to dogs and cats and that onions can cause a life-threatening form of anemia. And while broccoli, cauliflower, and other vegetables in the brassica family (cruciferous vegetables) can be healthy additions to diet, but can have a troublesome affect on thyroid function unless they're cooked before feeding. But there are human foods that, when used as a supplement to a dog or cat's diet, can be quite beneficial to their health. Our pets have thrived on our leftovers for hundreds of years, but with increasingly unhealthy diet choices in human meals, we need to be careful what we offer our pets from our own plates. Human foods such as meats, fish, cheeses, and other animal products can be used regularly in a healthy pet's diet. We just have to be sensible about what we feed, and, of course, how much. So what should you skip? Avoid feeding your pet any corn, wheat, soy, or peanut butter in food or treats. Be aware that glutens, spelt, maize, breads, corn syrups, and pasta are other names for wheat and corn products. Dogs who have "sensitive stomachs" may just need a healthier diet of fresher foods. The GI tract depends on a large amount of appropriate bacteria to function properly, and to decrease gas and improve stool consistency. Because the foods we feed our pets tend to be so carefully packaged to avoid bacterial pathogens, it may be difficult for animals to obtain proper bacteria for their gastrointestinal tract. A periodic probiotic supplement or some yogurt (and if you can find it, goat yogurt is even better than cow yogurt) can help re-populate the GI tract and improve digestive health. Other over-the-counter probiotics can be used as a pet supplements as well. Dairy-free versions are available for sensitive animals. Just remember to look for well-sourced organic products from respected companies. Aside from the occasional meat treat or healthy leftover, here are five additional foods that you should be feed your pet, and why they're good for your furry friend. For a Superman-strength stool regulator, give your dog or cat a bit of pumpkin. It regulates moisture and provides a gentle fiber, making it a terrific tool to combat constipation or diarrhea. Dosage is 1 tablespoon once or twice daily for a 30-pound dog or a 1/2 teaspoon for an average cat, in food or as a treat. I'm surprised at how many cats like to eat straight pumpkin from a spoon, but you also can mix pumpkin with meat, baby food or yogurt. Fun idea: Put the pumpkin or pumpkin mixes (with yogurt, meat baby foods or other meat-based treats) into ice cube trays or in rubber toys, or in spoonfuls on wax paper and freeze to use later as treats. This also solves the problem of open cans of pumpkin from going bad in your fridge. Omega-3 fatty acids such as fish oil aren't just good for humans, they can improve your pet's coat and him recover from inflammatory conditions, arthritis, and skin problems. How? Omegas encourage free-radical scavenging, which can decrease inflammation. But take note: Carnivores do not efficiently convert plant sources of omegas, like flaxseed or hemp, so stick with fish oils. I personally believe pet owners should avoid feeding their animals krill oil (which is derived from small crustraceans usually found in the Arctic and Antarctic seas), since it's the only thing whales eat, so let's not be cruel and take it away. While Omegas are usually a helpful supplement, they're not for all pets. Fish oil may not be recommended for an animal that is overly hot, and has oily/hot skin or loose stools. If you're giving your pet Omegas, be sure to monitor the response to see if they're right for your animal. Many foods, including many raw foods, may not include enough fiber. Typically a scavenger or carnivore would eat a good deal of fiber – including roughage like hair, feathers, and nails. And those are not typical ingredients in pet foods. Adding psyllium fiber (about a teaspoon per meal for a 50-pound dog or a 1/4 teaspoon for an average cat) is a great way to improve the fiber content of the food. Derived from the husks of seeds in the Plantago family, Psyllium fiber contains a high level of soluble dietary fiber. It can be found in most supplement sections of your local drugstore or supermarket. Fiber moving through the GI tract can be used to improve symptoms of both loose stool and constipation, and may even enhance the ability to fight off GI parasites. Cooked white rice can relieve signs of diarrhea. But how you prepare it can really make a difference. Cook the white rice with extra water and overcook until it is gloopy. Your pet's system can absorb it better when it's overcooked and sticky-wet. The reason it works is because of its absorbent quality, not its nutritive value, which is why brown rice is not as effective for diarrhea and loose stools. But do not use Minute Rice; all the good absorbent stuff has been processed out of it. Warm, low sodium chicken or beef broth — or even plain warm water — can be added to pet food to increase palatability. The meat broth itself can enhance the flavor of foods, and foods smell more appetizing when they are warmed. In addition, if you're concerned about hydration, pets will drink more fluids if the fluids taste good. Barbara Royal is a veterinarian in Chicago who is internationally renowned for her work in integrative medicine and physical rehabilitation. She is the author of "The Royal Treatment: A Natural Approach to Wildly Healthy Pets" and the go-to veterinarian for Oprah Winfrey. Dr. Royal currently is president of the American Holistic Veterinary Medical Association and president-elect of the AHVM Foundation. She also is the founder and owner of The Royal Treatment Veterinary Center in Chicago.